This book is the third in a series. Global counterfeiting mastermind Giorgio Cattoretti takes Elaine under his wing, tempting her with heady amounts of money to apply her expert knowledge to improve his near-perfect U.S. bills. But Elaine still loves Nick. When Nick enters the picture, it maybe too late. With nowhere to turn, will Elaine give in to a life of crime, or will she find the love she has always wanted? I got this book after reading the first 2 books, i couldn't wait to read the conclusion to the series. Elaine still finds herself in the hands of Giorgio with no passport and no money. 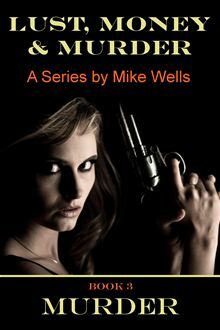 After been offered a staggering amount of money she is torn between doing the right thing and butting a stop to the crime she set out to destroy and the world of money,crime and luxury. will she do the right thing? or will her life take a more drastic change when someone unexpected turns up to aid her. Will she make it out alive when she finds not everything is how it seems and the man she is working with had more of an input in her life than she thought? Also always i loved Elaine, i thought she was a strong female lead, but at the same time there was some situations where she irritated me about and others where i felt really sorry for her! I was so glad that she had a happy ending because for a moment i didn't think she would! The conclusion to the Lust, Money & Murder series was amazing, beautifully spun together in to an action packed, heart felt ending!